The Destiny pendant symbolizes the destiny of each human being as part of the whole creation. 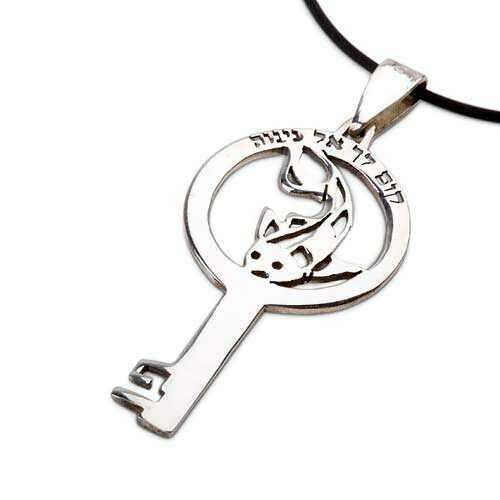 The phrase engraved in Hebrew on the pendant is “Arise, go to Nineveh”, taken from the book of Jonah. The book of Jonah tells the story of Jonah, son of Amittai, sent by g-d to the city of Nineveh, whose people have sinned, to warn them that their city will fall if they do not change their ways. Jonah, refusing to accept his destiny, tried to escape it. 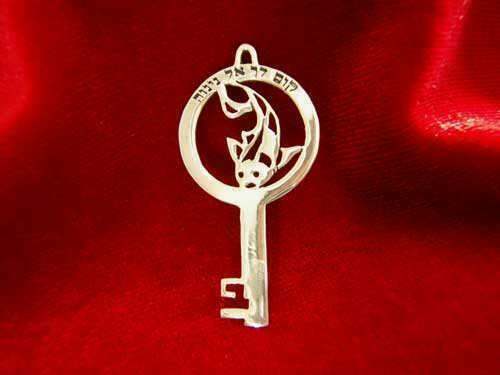 The fish in the center of the key is the fish that swallowed Jonah and took him to the depths of the sea (allegoric). In the end, Jonah understood, that his own will is merely the difference between his concept of self and his concept of oneness with g-d.
At the end of the book, g-d teaches Jonah that compassion is the highest value of all. 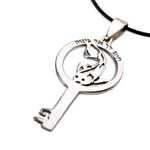 The bottom of the key contains the letter PEH (also stand for "mouth" in Hebrew) which represents the word of g-d. The void created by the shape of the letter PEH, takes the form of the letter BEIT - the first letter of the word BRIAA = creation.